The hackberry emperor, Asterocampa celtis (Boisduval & Leconte), is also known as the hackberry butterfly (Miller 1992) although the latter name is somewhat misleading because there are two other eastern United States butterflies - the American snout, Libytheana carinenta [Cramer], and the tawny emperor, Asterocampa clyton [Boisduval & Leconte] — and also a number of other Asterocampa species, in other areas, that use hackberries as their exclusive caterpillar host plants (Scott 1986). 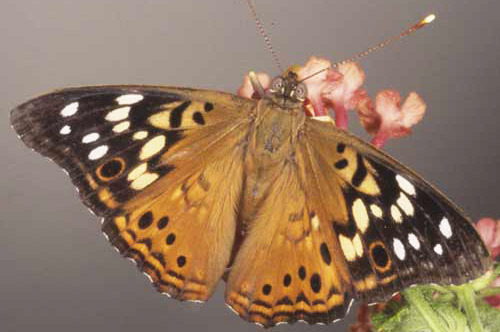 The hackberry emperor is a common butterfly of river bottoms and other areas where its host plants are common but it also may be found in upland areas. Historically, dense swarms have been documented in some southern states (Lambremont 1984). Figure 1. Dorsal wing view of an adult hackberry emperor, Asterocampa celtis (Boisduval & Leconte). Photograph by Jerry Butler, University of Florida. 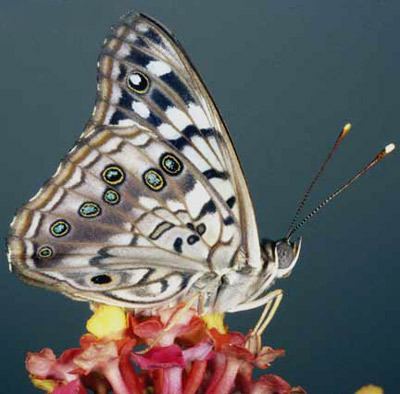 The hackberry emperor is found from northeastern Mexico northward into the southwestern U.S. and to Nebraska and throughout most of the eastern U.S. except for the northern half of Wisconsin, Michigan and New York and all of New England (Opler and Krizek 1984, Opler et al. 2009). 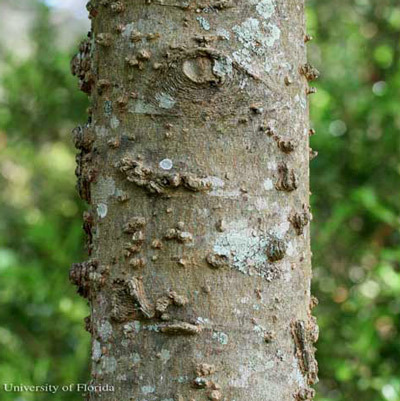 It is common in northern and central Florida but is infrequent in southern Florida (Minno et al. 2005). Adults: The wing spread of adults is 2.0 to 2.6 inches (Daniels 2003). Adults are somewhat variable regionally and the variants (races) are sometimes given subspecific names. The northern (and Florida panhandle) race is "celtis". The peninsular Florida race is designated "reinthali" (Cech and Tudor 2005, Minno and Minno 1999). Figure 2. Ventral wing view of an adult hackberry emperor, Asterocampa celtis (Boisduval & Leconte). Photograph by Jerry Butler, University of Florida. Eggs: Eggs are white or pale yellow and surrounded by a series of vertical ridges. Figure 3. Eggs of the hackberry emperor, Asterocampa celtis (Boisduval & Leconte). Photograph by Don Hall, University of Florida. 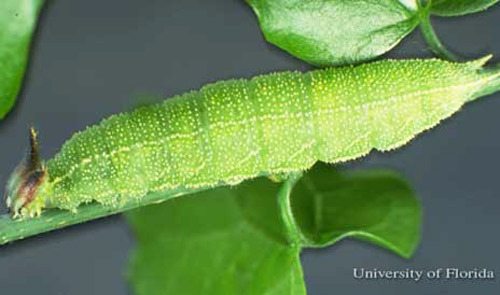 Larvae: Full grown larvae are approximately 1.4 inches in length (Minno et al. 2005). The lower half of the head is green with short green spines laterally. The upper half of the head is brown with a pair of stout black horns dorsally. See Wagner (2005) for excellent drawings of the cephalic horns and lateral spines of the hackberry emperor and tawny emperor. Figure 4. Larva of the hackberry emperor, Asterocampa celtis (Boisduval & Leconte). Photograph by Jerry Butler, University of Florida. 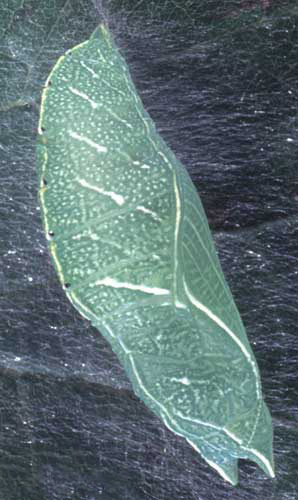 Pupae: The pupae are green with small white spots and a white mid-ventral line that branches and runs to the tips of two horns at the anterior end of the pupa. There are also two white lateral lines and diagonal white lines on the sides of the abdomen. 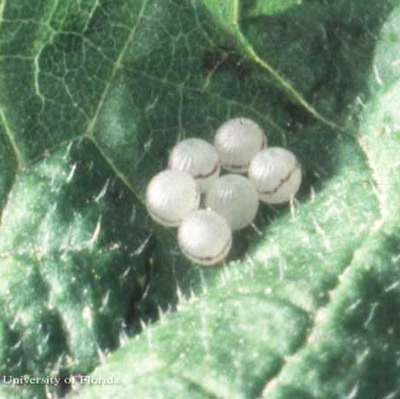 The pupae are attached to a silk pad by the cremaster. Figure 5. Pupa of the hackberry emperor, Asterocampa celtis (Boisduval & Leconte). Photograph by Jerry Butler, University of Florida. The larval hosts of the hackberry emperor are hackberry trees (Celtis spp.) in the family Celtidaceae. 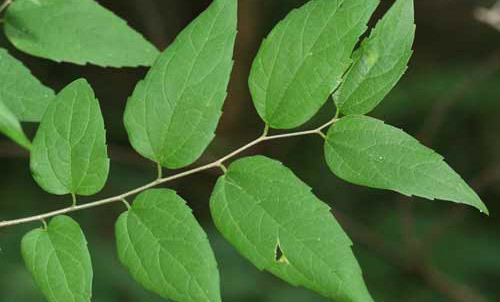 The two most common hackberries in the eastern U.S., the more northern hackberry, Celtis occidentalis Linnaeus and the more southern sugarberry, Celtis laevigata Willd., can usually be recognized by the slightly to heavily warty appearance (or pronounced ridges on mature C. occidentalis) of the bark. More information and a key to the Celtis species is available at efloras.org (undated) . Figure 6. Hackberry, Celtis occidentalis L. (Celtidaceae), a larval host for the hackberry emperor, Asterocampa celtis (Boisduval & Leconte). Photograph by Don Hall, University of Florida. Figure 7. Hackberry, Celtis occidentalis L. (Celtidaceae), a larval host for the hackberry emperor, Asterocampa celtis (Boisduval & Leconte). Photograph by Don Hall, University of Florida. Figure 8. Warty trunk of the sugarberry, Celtis laevigata Willd., a host of the hackberry emperor, Asterocampa celtis (Boisduval & Leconte). Photograph by Don Hall, University of Florida. Figure 9. Heavily warty trunk of the sugarberry, Celtis laevigata Willd., a host of the hackberry emperor, Asterocampa celtis (Boisduval & Leconte). Photograph by Don Hall, University of Florida. Efloras.org. (Undated). 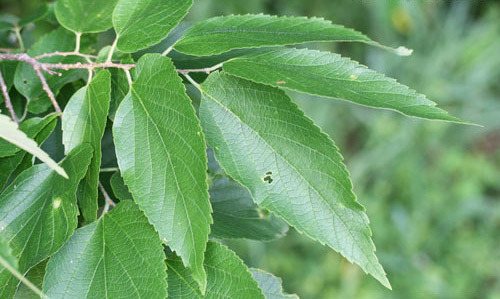 Celtis Linnaeus, Sp. Pl. 2: 1043. 1753; Gen. Pl. ed. 5, 467, 1754. Flora of North America. (18 May 2009). Lambremont EN. 1984. 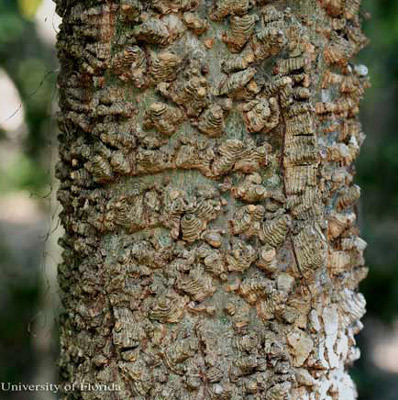 Hackberry butterflies: dense swarms involved in a litigation in southern Louisiana (Nymphalidae: Asterocampa). Journal of the Lepidopterists' Society 38: 252-253. Langlois TH, Langlois MH. 1964. Notes on the life-history of the hackberry butterfly, Asterocampa celtis (Bdvl. & Lec.) on South Bass Island, Lake Erie. The Ohio Journal of Science 64: 1-11. Opler, PA, Lotts K, Naberhaus T. (2009). Butterflies and Moths of North America. (11 September 2014). Solomon JD, Vowell TE, Jr., Horton RC. 1975. Hackberry butterfly, Asterocampa celtis, defoliates sugarberry in Mississippi. Journal of the Georgia Entomological Society 10: 17-18. Publication Date: May 2009. Latest revision: September 2014.